The Student Leadership Committee has selected the Portland Neighborhood House, as the focus of the National Book Drive project. The Portland neighborhood is located in one of Louisville’s most disadvantaged areas, and the Neighborhood House has expressed a need for books appropriate for middle-school-aged children. All Sigma Tau Delta and Sigma Kappa Delta chapters are encouraged to bring books to the Annual Convention and to make a lasting impact on this city. A $100 donation will also be given in the name of the chapter that makes the most substantial contribution. For more information, contact Student Advisor Micah Hicks. 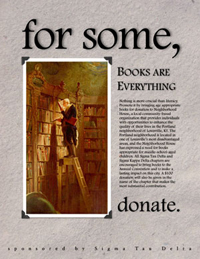 Book Drive Posters: download and print 8/1/2" x 11" page size.